Perfect Medical Product, is incorporated in the year 2007. We are Distributor, Manufacturer, Exporter & Wholesaler of a huge gamut of Medical Equipments to our clients across the globe. Our comprehensive range of these products includes Gas Outlets, Flow Meters, Gas Regulators, Ward Vacuum Units, Gas Manifold with Control Panel, Line Pressure Alarm, Adapters, Humidifier Bottles, Laryngoscope, Rotameters, Circle Absorber And Anesthesia Equipments etc. Our range is manufactured using premium quality materials that are sourced from the trusted vendors in the market. These are designed and fabricated in our advanced manufacturing unit under the guidance of our expert professionals. We also check the quality of the products on various parameters to ensure their utility in various applications in different sectors. Under the guidance of our mentor, Mr. S. K. Selim Chowdhury, we captured market for our clients. By his vast industrial experience, we offer unmatched range of these products to our clients. Our manufacturing unit is equipped with an area of 550 square feet. We offer various products to our clients in different sizes and can be customized as per the specifications provided by the customers. 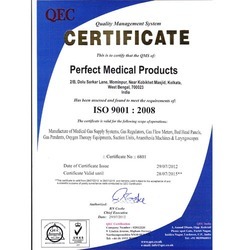 We offer these medical products as per the requirements of the clients. Our unit is upgraded on a regular basis and meets the bulk demand of the clients. We have our well-trained engineers and experts for handling this unit very efficiently. We are an industry leading Distributor, Manufacturer, Exporter, Wholesaler and Retailer of Medical Products. Our product range encompasses F. A. Valve-Jacketed Flow Meter & Humidifier Bottle, Metal BPC Flow Meters with Humidifier Bottle, Black Lid & Steel Handle, Ward Vacuum Unit, Laryngoscope 4 Blades with Handle & Pouch, Single & Twin Pipe Line Adapters, and Gas Manifold with Control Panel. Apart from these, we also manufacture a wide range of Self Sealing Valves & Key Plugs, Self Sealing Covers, OFWD (Alarm), Humidifier Bottles, Rotameters, Single Stage Oxygen and Nitrous Oxide Regulators. Our product range finds extensive usage in medical sector, including laboratories, hospitals, clinics and health care centers. We manufacture our complete range using premium quality raw material, which is procured only from reliable vendors. Our organization has achieved an enviable position in the domestic and international market with its high-quality products. We are catering to a huge clientele because of our ethical business practices and efficiency in meeting client''s requirements.